The last day in the field on an extended collecting trip is always bittersweet for me. Throughout the trip I keep a frenetic pace trying to see as much as possible – the more localities you visit, the greater your likelihood of success. But it’s exhausting – during the day if I’m not exploring an area I’m driving to another one, and in the evening I’m either cleaning up, restocking on supplies, entering the day’s data into the computer, or jotting down thoughts about what I’ve seen. I really love these trips, but eventually exhaustion catches up and my brain starts feeling overloaded by all that I’ve learned. If collecting hasn’t been good, I just want to be home. If collecting has been good, however, I almost have to tear myself away from the field. Either way, I have that long, monotonous drive staring me in the face. Yesterday, my last day of collecting on this trip, was supposed to be nothing more than a quick look at a few localities in or near the eastern edge of the Nebraska Sand Hills before undertaking that 10-hour drive. 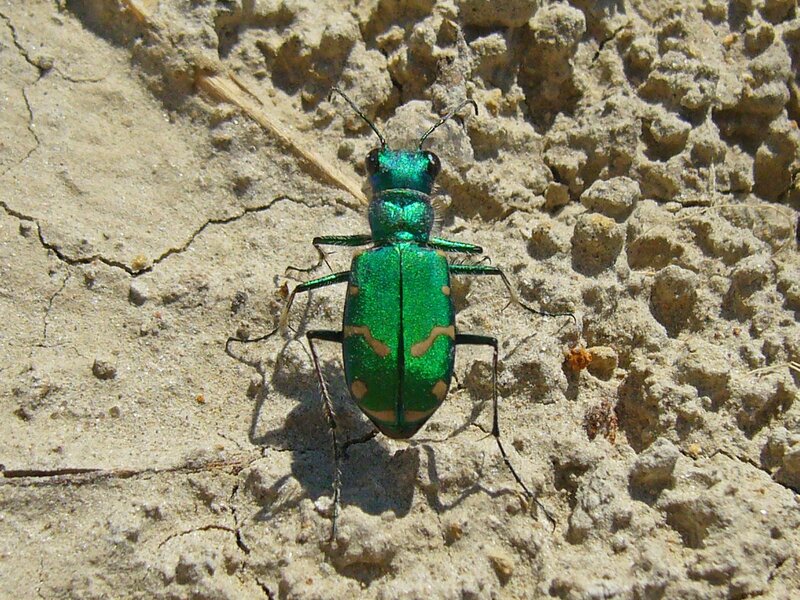 I had already succeeded in finding Cicindela limbata (sandy tiger beetle) in the western Sand Hills, but I wanted to locate one of these eastern Sand Hills populations because of the distinct reddish elytral coloration exhibited by individuals at this, their easternmost distributional limit (as opposed to the normal green in more western populations). 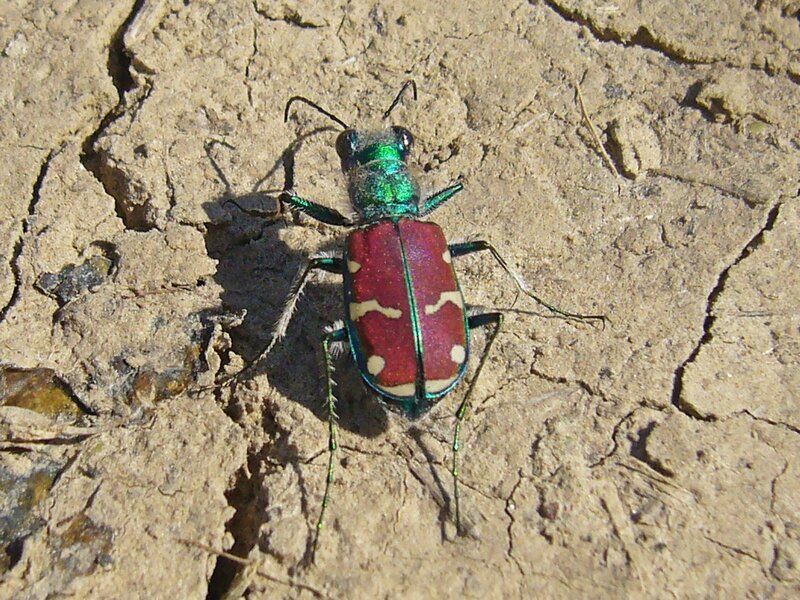 I had also not yet seen C. denverensis (green claybank tiger beetle), a western relative of C. limbalis (common claybank tiger beetle) and C. splendida (splendid tiger beetle) that differs by its green rather than brick-red elytra. Despite driving long and getting to bed late the previous night, I got up early and headed for the sand dune locality, hoping I would find it quickly so I could then go to the clay location before dropping down through Grand Island to I-80. 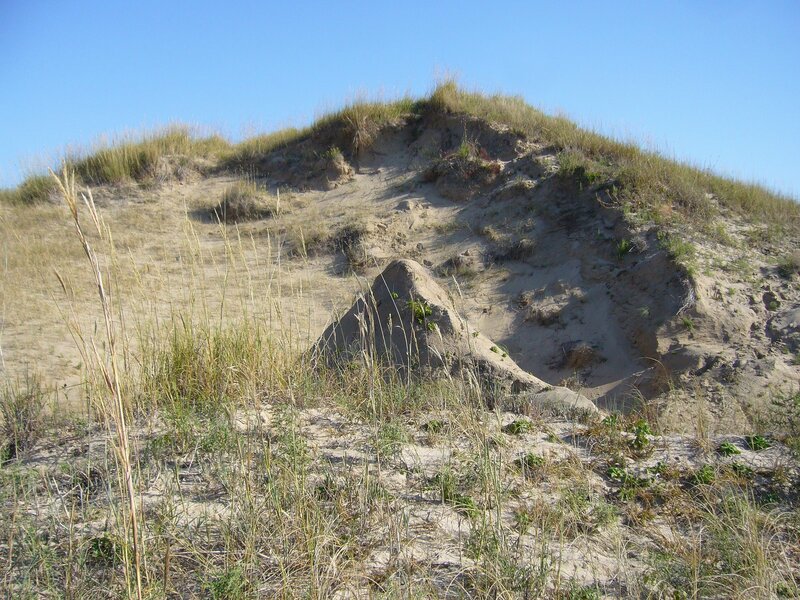 The sand dune locality looked perfect for C. limbata – large, stabilized sand dunes with steep blowouts like those I had seen the previous day in the western Sand Hills. I looked around the first sand blow I came to, but the early morning sun still had not warmed the face of the blowout so nothing was out yet. I hiked over to the next blowout – a little larger, more barren, and facing the sun – but still no activity. I spotted another even larger blowout still further back and hiked over to it. Again, despite apparently perfect habitat and conditions I saw nothing. I started looking for potential burrows and digging them out, but every burrow dead ended in the sand. I wondered if it might be too early in the day still, although it just didn’t seem possible as it was now past mid-morning. I’d seen the adults in the western Sand Hills already burrowing back in to avoid the heat of the day starting around noon – they just must be out in the morning, I thought. I went back to the second blowout and searched again, then back to the first. I’d searched for over an hour by this point, and I was ready to accept that I hadn’t found the right site and to cut my losses and move on. But I vacilated and then decided I needed to give those second and third blowouts just one more look (Gayle Nelson and his persistence came to mind). Well, the third time was a charm! I saw two adults on the second blowout, and by the time I got to the third blowout I saw several individuals on the most barren portions of the blowout face. 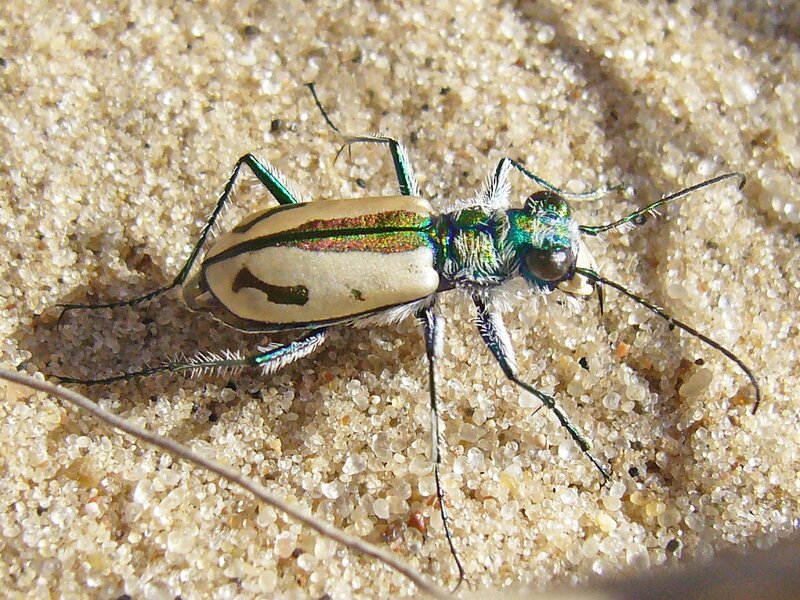 At this point, I was really really glad I hadn’t given up earlier (note to self – on future tiger beetle trips, time arrival at sand dune sites during late morning!). At first I thought a field photo would be impossible – they were just so alert, and their small size and white coloration made them difficult to see before alarming them. But again persistence paid off and after several attempts I ended up with about as fine a photo as I’ll ever be able to take. These delicate little beetles certainly rank as among the most beautiful I’ve seen on this trip. Having just left the southern edge of the Sand Hills on my way to the second locality, I spotted this vertical clay bank just north of the North Loup River with a 2-track road following below it – that’s tiger beetle land, folks! I hadn’t walked in very far at all when I saw C. splendida on the 2-track – another species for the trip! I took a very routine swing at the beetle with my net, and while doing so stepped on the edge of a small drop and twisted my left ankle. My left leg buckled, leaving my weight on my right leg but in a wrong position, which caused my right knee to pop out (an old college injury). Now both legs buckled and I slumped onto the side of the 2-track – paralyzed in pain! I remember muttering to myself, as I lay there clutching both legs, “Oh, please let me be able to walk!” After what seemed like several minutes, I started trying to get up. I noticed my net laying on the ground and my next thought was, “I wonder if I got the beetle.” (I didn’t). I gradually got myself back up and found that I could walk – but only gingerly. My left ankle was definitely sprained, but my right knee seemed like it was okay. A more rational person probably would’ve said that was enough and called it a day, but C. spendida was here – I couldn’t just leave! I continued walking the 2-track and found good numbers of not only C. splendida, but also C. limbalis (very similar to C. spendida but with red on the pronotum). After collecting a small series of the two species (which took a while – I was swinging the net quite gingerly and missing many beetles because of my ankle), I started concentrating on trying to get some field photos. My success in photographing C. limbata earlier in the day had given me some confidence to make the attempt – again, they were extremely wary and hard to approach, but through repeated attempts and persistence I finally got a few photos of each that I was happy with (I especially like the one of C. limbalis demonstrating the “tip toe” position that members of this genus often assume, presumably for heat regulation). I noted considerable variation in the elytral markings on both species – ranging from the two fully maculated individuals shown here to individuals with the median elytral marking reduced to just a lateral hash mark. I also saw a few individuals of C. splendida with the pronotum a brilliant cobalt-blue (so-called form “cyanocephalata“, although it lacks any formal taxonomic status) but unfortunately was not able to obtain photos of these. After hobbling back to the car, I made one more irrational decision – I still hadn’t found C. denverensis and decided to go to one more spot to look for it, even though doing so would probably mean arriving home after midnight that night. My ankle was seeming to be holding up okay, at least well enough on level ground, and I really wanted to see this species. Sometimes my singlemindedness knows no bounds. 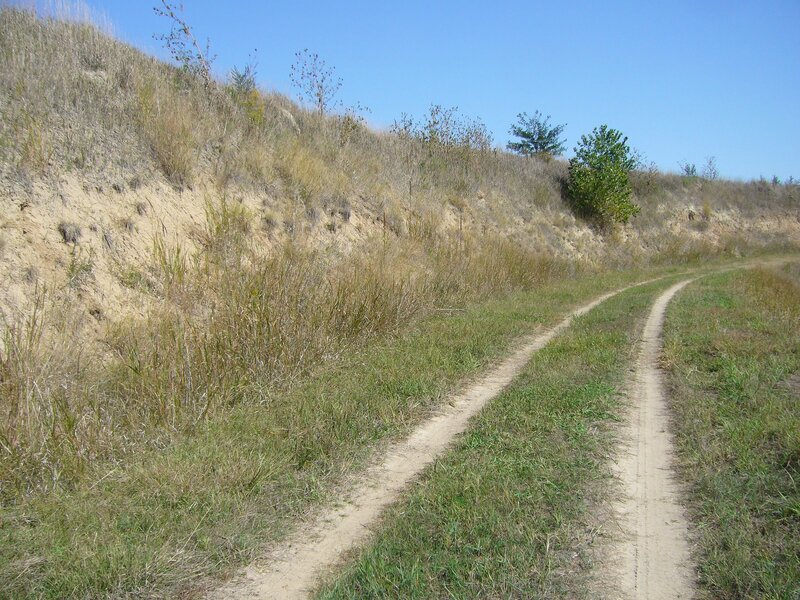 I drove to a spot a little further back to the west where I knew the species occurred – a minimal maintenance (i.e., “dirt”) road with a fascinating vertical clay bank on one side. I hadn’t walked more than 20 yds down the road when I saw C. denverensis on the edge of the road – species number 13 for the trip! The range of this western species overlaps with those of its close relatives C. limbalis and C. splendida in this part of Nebraska, apparently resulting in some hybridization between these species. This has caused some interesting patterns of variation in markings and coloration among the three species. The C. denverensis individual pictured here (again, persistence!) shows more complete elytral markings – like those of C. limbalis and C. splendida pictured above – but I also saw individuals with incomplete maculations as well as differing shades of green. Cicindela splendida was also present at this site (but, interestingly, not C. limbalis), and I was fortunate to get some good photos of this individual showing the fascinating habit of these beetles to fly up and crawl about on the vertical bank when alarmed – note the larval burrows also on this vertical bank. It still amazes me how the larvae of these species are able to secure any prey on these vertical surfaces! The individual pictured here also shows the reduced maculation I’ve talked about for this trio of related, clay-inhabiting species. 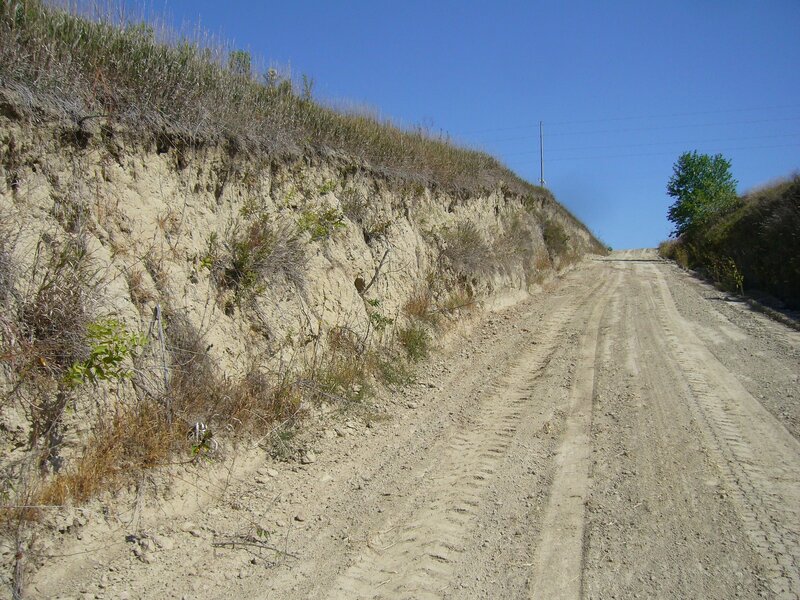 Additional vertical clay banks could be seen stretching further down the roadside – they were tempting, but at this point I finally, grudingly said “enuf” and began the drive back towards St. Louis. 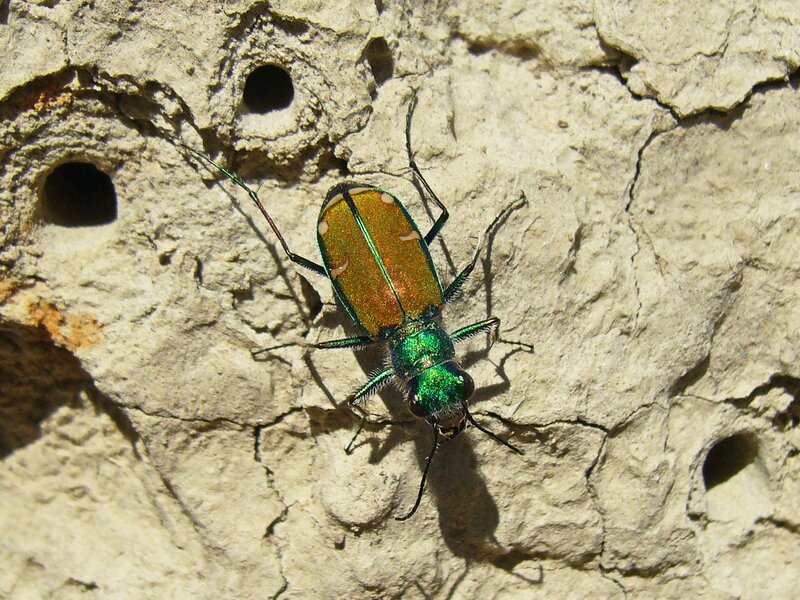 I arrived home in the wee morning hours and breathed a sigh – the annual fall tiger beetle trip was officially over! 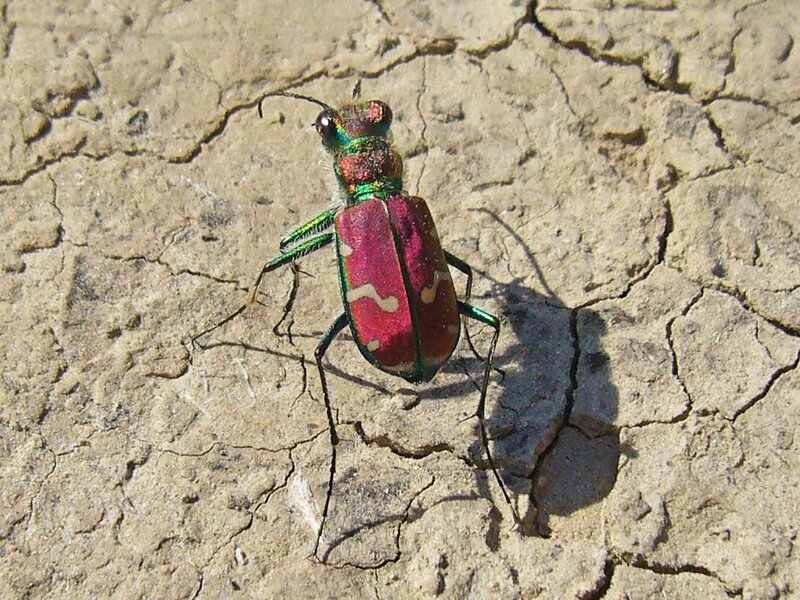 Those beetles certainly have pretty markings. I like that one photo with all the holes in the bank, behind the beetle. That is a very nice photo. Thanks, zhakee. Yes, I was concerned about that, and my ankle was quite sore the following day. But yesterday both it and my knee were better, and today they are much better. I really do like that vertical bank photo myself – thanks! Thanks so much for taking the time to put together such extensive postings with great photos. I feel almost like I got to accompany you on your trip. Seeing 13 species on the trip is very impressive. You really need to get out to Willcox Playa during the monsoons. The summer before last I saw 9 species in just a few hours one afternoon. It’s amazing. Glad your ankle is doing better. Thanks, Doug – I’m glad you enjoyed it and hope others did as well. Truthfully, I did these postings as much for myself as anything – I feel like I learned so much more and will have a nice accounting of the trip for future reference. As I commented on an earlier post, it has become more about how much I learn than how much I see. The fact that I was able to learn as much as I did and at the same time add to our knowledge of M. comanchei and C. nebraskana (if even incrementally) is really the highlight of the trip for me. What a day. It reminds me of some of the ones I used to have walking the Carolina Bay I collected data in. I ended up having quite the love/hate relationship with that bay. Glad to hear your injuries weren’t too lasting. asj – Thanks for visiting and your nice comments. I too enjoyed your LRGV trip report, as it’s an area I’ve visited many times in my quest for woodboring beetles. Wonderful descriptions of the ‘leaving no stones unturned’ approach that makes these trips so much fun. cedrorum – I even started riding my bike to work again yesterday (15 miles each way!). Now that my ankle doesn’t hurt, I’ll remember the day fondly for the rest of my life!